Hyperion Books for Children, 9781423143420, 64pp. 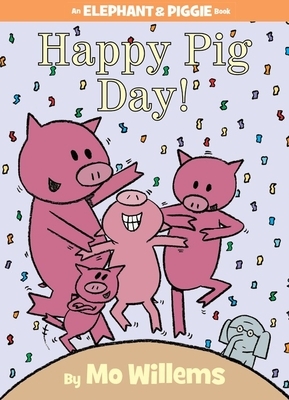 Using vocabulary that is perfect for beginning readers (and vetted by an early-learning specialist), Mo Willems has crafted a heartfelt story about celebrating the special occasions in life. Fans of the Geisel Award-winning duo will want to join the party! Mo Willems (www.pigeonpresents.com), a number one New York Times best-selling author and illustrator, has been awarded a Caldecott Honor on three occasions (for Don't Let the Pigeon Drive the Bus!, Knuffle Bunny: A Cautionary Tale, and Knuffle Bunny Too: A Case of Mistaken Identity). Don't Let the Pigeon Drive the Bus! was also an inaugural inductee into the Indies Choice Picture Book Hall of Fame. Other favorites include Naked Mole Rat Gets Dressed and City Dog, Country Frog, illustrated by Jon J Muth. Mo began his career on Sesame Street, where he garnered six Emmy Awards. He lives in Northampton, Massachusetts.